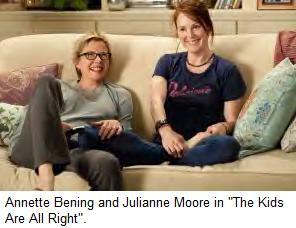 "Julianne Moore and Annette Bening shine in a comedy the family-values crowd could love -- almost." In depicting a lesbian marriage that's about as traditional as a marriage gets -- right down to the drinking, the squabbling, the cheating and the profoundly embarrassing moments in front of the kids -- [director] Cholodenko has arguably made a more revolutionary and transgressive film than you'd see in a dozen queer-cinema festivals in lower Manhattan or the Castro District. This lesbian-mom filmmaker (Cholodenko and her partner, one-time pop musician Wendy Melvoin, have a young son) has made the gay-marriage comedy that America needs right now. Thankfully, she made it before the farcical Hollywood version that you just know is somewhere in the pipeline.